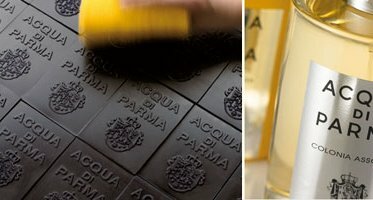 Best known for their signature cologne (Colonia) first introduced in 1916, the Italian line Acqua di Parma also produces several other fragrances and a plethora of bath, body and home fragrance products. In 1994, three Italian businessmen purchased Acqua di Parma, relaunched the Colonia fragrance in international distribution and began expanding the company's product line. Acqua di Parma's perfume business is now majority-owned by Louis Vuitton Moët Hennessy (LVMH). Fragrances in the regular Acqua di Parma line include Colonia Assoluta (2003), Profumo and Iris Nobile (2004). An Eau de Parfum version of Iris Nobile launched in 2006. Recent fragrance releases include Acqua di Parma Colonia Intensa (2007), Profumi di Acqua di Parma (2008, new version of a 1930 fragrance), Magnolia Nobile (2009), Colonia Essenza (2010), Gelsomino Nobile (2011), Colonia Intensa Oud (2012), Iris Nobile Sublime (2012), Acqua Nobile Gelsomino (2013), Acqua Nobile Iris & Acqua Nobile Magnolia (2013), Colonia Leather (2014), Rosa Nobile (2014), Acqua Nobile Rosa (2015), Colonia Ambra (2015), Colonia Club (2015), Colonia Sandalo (2016), Colonia Quercia (2016), Note di Colonia (2016), Peonia Nobile (2016), Colonia Ebano (2017), Colonia Mirra (2017), Colonia Pura (2017), Note di Colonia IV (2017), Colonia Vaniglia (2018). An offshoot, Blu Mediterraneo, was established in 1999, and also produces fragrances and body products. In 2005, the Blu Mediterraneo line was streamlined and relaunched to better focus on its intended positioning as "a casual, hedonistic [and] natural part of the Italian lifestyle".1 In 2012, the line was repackaged again, this time in blue versions of the standard Acqua di Parma bottle. Fragrances in the Blu Mediterraneo line include Arancia di Capri (orange), Cipresso di Toscana (cypress, discontinued then reissued in 2019), Mandorlo di Sicilia (almond), Fico di Amalfi (fig) and Mirto di Panarea (myrtle). Recent releases include Bergamotto di Calabria (2010), Ginepro di Sardegna (2014), Cedro di Taormina (2016), Chinotto di Liguria (2018). In the US, the line can be found at selected Neiman Marcus and Barney's department stores, as well as online at Bigelow Chemists, Space NK and Sephora. In the UK, try Harrods, Liberty or Escentual. Elsewhere, try Senteurs d'Ailleurs in Brussels or First in Fragrance in Germany. See all articles on Now Smell This tagged Acqua di Parma. 1. Via Women's Wear Daily, 3/24/2005.